ETH Zurich’s Multi-Scale Robotics Lab within the Institute of Robotics & Intelligent Systems; Imperial College London’s Hamlyn Centre for Robotic Surgery; and Johns Hopkins University’s Laboratory for Computational Sensing & Robotics. I just noticed that I seem to have a little bit of association with each of these three overseas partners. Last week, on my way to the World Economic Forum at Davos, I called on the Mayor of Zurich, Corine Mauch, to renew our friendship and explore new opportunities for collaboration between Zurich and Hong Kong, and technology was one of our agreed priorities. Today we are welcoming ETH Zurich to Hong Kong. Then I had first-hand knowledge of the work of Imperial College London’s Hamlyn Centre, which I visited during my first official trip to London in September 2017 in my capacity as the Chief Executive, and since then we have maintained close contacts with Prof Yang. I also met with President Ron Daniels of Johns Hopkins University when he was in Hong Kong last year. I am therefore extremely pleased that my visits and meetings with renowned institutions all bear fruit within a short period of time. But I am certainly not suggesting that they are charmed by me to come to Hong Kong. Instead, I believe they find in Hong Kong the appeal of excellent research capability, strong fundamentals including the rule of law, intellectual property protection, proximity to manufacturing powerhouses like Shenzhen and supportive government policies. Indeed, Hong Kong has long enabled connections between East and West, and long attracted people, companies and institutions, bringing them together to excel, whatever their aspirations are. In terms of supportive government policies, since becoming Chief Executive of the Hong Kong Special Administrative Region about 18 months ago, I have committed US$10 billion towards a broad spectrum of innovation and technology initiatives. That includes specifically US$1.3 billion earmarked for the creation of two major research clusters in the Hong Kong Science Park. One is focused on healthcare technology, the other on robotics and artificial intelligence. I’m pleased to know that the Multi-Scale Medical Robotics Centre has already applied for admission to the latter – AIR@InnoHK Cluster. My Government has also introduced enhanced tax deductions up to 300% for R&D expenditure incurred by private enterprises. In addition, we have launched programmes supporting R&D institutions that wish to add technology talent to their operations. In this connection, I know the new centre is as committed as we are to talent development, with training to be provided to surgeons, engineers and others keen to gain expertise in robotics technology. Today’s global alliance, made up of the three international institutions and the Chinese University, are all pioneers in medical robotics. The Chinese University of Hong Kong is the first post-secondary institution in Asia to establish a robotic surgery training centre. To date, more than 1,300 robotic console surgeons from Asia have been trained here. Recently, the Chinese University completed the world’s first multi-disciplinary clinical trial of the advanced, single-port robotic surgical system. With the coming together of these four prestigious universities, and their world-class robotics expertise, there is much to look forward to. I’m confident the centre’s research will advance the diagnosis and treatment of multiple medical specialties. And I’m gratified to know that its research will be multidisciplinary, involving medical researchers, physicians, engineers and other specialists focused on developing robotics for innovative medical applications. 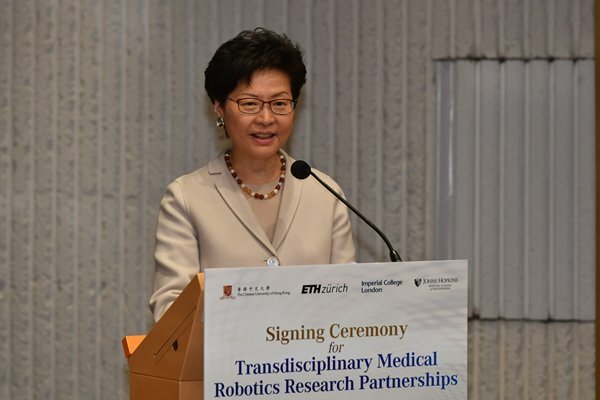 Chief Executive Carrie Lam gave these remarks at the Signing Ceremony for Transdisciplinary Medical Robotics Research Partnerships between the Chinese University of Hong Kong and overseas institutes on January 31. Jumpstarter aims to build, empower and boost Hong Kong’s startup ecosystem and entrepreneurship by bringing entrepreneurs, corporates, investors and the public together, helping to transform Hong Kong into a leading hub for global innovation and technology (I&T). This echoes well with the policy objective of the current-term Hong Kong Special Administrative Region Government in developing an inspiring environment conducive to I&T, with a view to creating new industries and wealth, providing more employment for young people, promoting upward mobility and improving people’s livelihood. Capitalising on our advantages under “one country, two systems”, strategic geographical location, established legal system, robust protection for intellectual property, highly efficient financial platforms and world-class universities, with four of our universities among the world’s top 100, Hong Kong has gained a solid footing in driving I&T growth. Indeed, President Xi Jinping has openly indicated that Hong Kong has a solid science and technology foundation and a strong pool of quality technology talent, and pledged to support the development of Hong Kong into an international I&T hub. 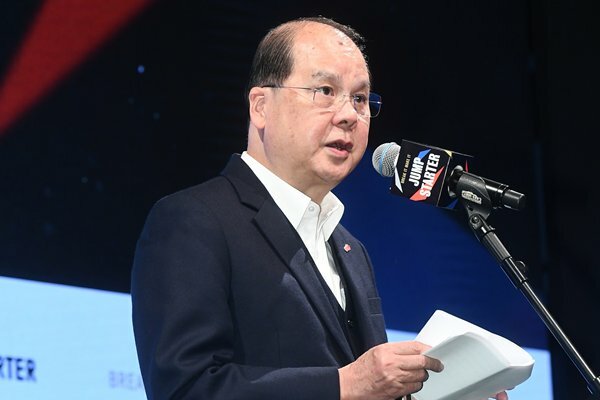 Looking forward, the development of the Guangdong-Hong Kong-Macao Greater Bay Area and collaboration between Hong Kong and Shenzhen will connect the upstream, midstream and downstream sectors of innovation and technology industries, thereby developing an international I&T hub in the Greater Bay Area. The immense synergy effects so generated will provide powerful support for Hong Kong’s I&T ecosystem to thrive. To propel our I&T development forward, in the past three years alone, the HKSAR Government has committed over $100 billion to boost research and development, develop state-of-the-art I&T infrastructure, nurture I&T talent pool, provide investment funding and support measures to improve the ecosystem for startups. A vibrant startup environment plays a pivotal role in driving I&T development in Hong Kong. Hong Kong’s startup scene has experienced phenomenal growth in recent years. We are ranked among the top five fastest growing startup ecosystems and one of the world’s top 25 startup hubs. According to the latest survey results, there were over 2,600 startups in Hong Kong in 2018, up by 18% over 2017. The number of people employed by startups also skyrocketed to 9,548, an increase of 51% over the previous year. The HKSAR Government is determined to transform Hong Kong into a leading global hub for innovation and entrepreneurship where startups can use the city as a lab, a showcase and a global launch pad. We have introduced a series of measures to create a conducive ecosystem with state-of-the-art infrastructure and supporting facilities, heavy financial support and a full range of supporting services to nurture startups throughout their journey from conceptualisation to commercialisation, thereby enabling them to develop their ideas and create revolutionary new tech products and services. Our two flagship I&T institutions, namely the Hong Kong Science & Technology Parks Corporation (the manager of the Hong Kong Science Park) and Cyberport, fuel the growth of I&T startups by connecting all elements of the value chain, from innovative thinking, research and development and creative design to production. The Science Park offers three incubation programmes targeted for startups in the fields of new technology, biomedical technology and web and mobile technology. The HKSAR Government further provided additional allocation of $7 billion to the Science Park to launch the Enhanced Incubation Programmes last October to strengthen support for its tenants and incubatees. As for Cyberport, it runs a number of programmes to boost the growth of startups in Hong Kong, including the Cyberport Creative Micro Fund, the Cyberport Incubation Programme and the Cyberport Macro Fund, among others. Recently, Cyberport has launched the Overseas/Mainland Market Development Support Scheme to provide financial support for Cyberport programme graduates to explore new opportunities in markets on the Mainland and places overseas. To encourage venture capital investment in local I&T startups, we have introduced the $2 billion Innovation and Technology Venture Fund to attract private venture capital funds to co-invest with the HKSAR Government in local I&T startups on an investment ratio of about 1:2. In just seven months since the launch of the fund in last July, we have already partnered with six venture capital funds and started receiving their invitations. On pooling of technology talent, which is very important indeed, we have allocated $10 billion to support the establishment of two research clusters on healthcare technologies and on artificial intelligence and robotics technologies, to attract the world’s top scientific research institutions and technology enterprises to Hong Kong for conducting more midstream and downstream R&D (research and development) projects in collaboration with local universities and scientific research institutions. Such clusters will pool and nurture more technology talent in Hong Kong. We have also launched the Technology Talent Admission Scheme last June to fast-track the admission of overseas and Mainland talent in specific technology areas to participate in R&D work in Hong Kong. Last August, we further rolled out the Technology Talent Scheme to help nurture more I&T talent in Hong Kong by heavily subsidising eligible organisations to recruit postdoctoral talent for R&D work and training their staff in advanced technologies. Ladies and gentlemen, the Government’s investment promotion agency, Invest Hong Kong, has launched the StartmeupHK programme since 2013 to attract innovative and scalable entrepreneurs to Hong Kong and promote Hong Kong as a premier startup destination. It also provides a one-stop service platform to support startups and help build our ecosystem to transform Hong Kong into an attractive destination for entrepreneurs from around the world. The annual flagship event, the StartmeupHK Festival, attracted over 6,000 participants last year. This year, the festival is also held this week, starting from this Monday (January 21) until January 29. Today’s Jumpstarter event for sure is a highlight and icon of this “festive week”. However, the Government’s efforts alone are not enough. We need the support of the industries and practitioners like Alibaba to join hands to help cultivate a fertile ground for startups in Hong Kong to “jump start” and stand amongst the world’s best. I am most pleased to learn that Alibaba Hong Kong Entrepreneurs Fund is providing enormous support to startups through various schemes and incubation programmes. Chief Secretary Matthew gave these remarks at Jumpstarter held by Alibaba Hong Kong Entrepreneurs Fund on January 24. It is heartening to be here with you all today to celebrate the grand opening of the Xiqu Centre, the first major performance venue of the West Kowloon Cultural District. I feel privileged to have the opportunity to serve the development of the West Kowloon Cultural District since its early days in my various positions. As time goes by, it is clear to me and many people that the West Kowloon Cultural District is of huge significance to Hong Kong, and its contribution will go beyond arts and culture. Its success will enrich our quality of life, complement our economic vitality, and elevate the status of Hong Kong to among the great cities of the world. As in all world class cultural projects around the world in history, delivering this ambitious West Kowloon Cultural District project is no easy task. I wish to thank the West Kowloon Cultural District Authority, the architects and contractors, and many parties involved in bringing Hong Kong’s first venue tailored to the artistic needs of the rich traditional Chinese art form of xiqu to fruition. I would like to take this opportunity to pay particular tribute to the late Bing Thom, the lead architect of this project. Bing was born in Hong Kong, and the Xiqu Centre is his homecoming project. We are indebted to him for his exquisite work which has greatly enriched Hong Kong’s architectural scene. On the opening of this gem, I believe that everyone who has contributed to the project would share his thought: “I like to empower everyone. If you walk here and feel a little taller, I am happy.” This quote from Bing is now engraved on the sitting area in the Xiqu atrium. Let’s work together to take Cantonese opera and the xiqu art form as a whole to the next level and to the global stage through this Xiqu Centre. And let’s look forward to the commissioning of more world-class facilities in the West Kowloon Cultural District very soon. Thank you very much. 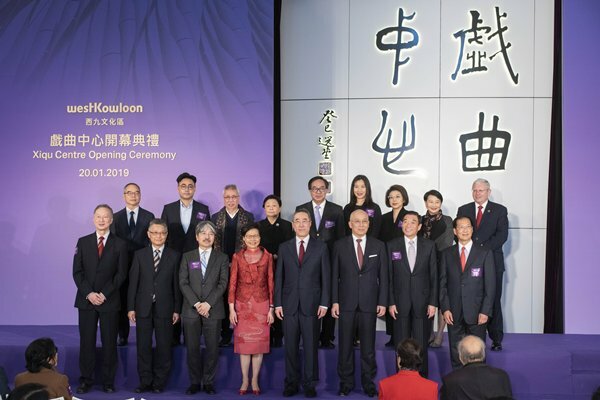 Chief Executive Carrie Lam gave these remarks at the opening ceremony for the Xiqu Centre at the West Kowloon Cultural District on January 20. Hong Kong’s human capital has all along been a major pillar underpinning the city’s present-day success, and it will continue to be a key driver propelling Hong Kong’s economic and social development. This term of the Hong Kong Special Administrative Region Government has a clear vision to develop Hong Kong further into a high value-added and diversified economy. To this end, we need to develop a good mix of talents who have broad horizons, equipped with different skillsets and a solid grasp of international affairs, to sustain our competitiveness and contribute towards the diversified development of Hong Kong. ​It is with this vision in mind that the Human Resources Planning Commission was established last year under my chairmanship to examine, review, and co-ordinate policies and measures in a holistic manner, with a view to formulating a co-ordinated human resources planning strategy to facilitate Hong Kong’s sustainable development in this ever-changing world. We must act swiftly, get prepared, identify opportunities and position Hong Kong as a key player in the global race, while rising to the challenges confronting us. ​Thanks to longer life expectancy and a lower fertility rate, Hong Kong is facing a rapidly ageing population. We now expect men in Hong Kong will live up to 81.7 years old and women to 87 years old. In 25 years’ time, men in Hong Kong are expected to live up to 87 years old, and for women, 92.5 years old. We are now ranked first in life expectancy in the world. According to the latest projection, our local labour force is expected to reach a plateau from this year until 2022, and then begin to dwindle afterwards. The ageing trend implies that our highly productive labour force will soon begin to diminish. A shrinking labour force will inevitably have a significant bearing on our future economic development. Hong Kong is a small and externally oriented economy and is often exposed to risks caused by fierce competition and sweeping changes in the global market. In parallel, the irreversible trend of rapid innovation and technology development has swept across the globe and revolutionised business processes and activities. These paradigm shifts bring about profound and broad-based implications on our human resources. Some quarters of society have expressed that Hong Kong is facing a skills mismatch, where a shortfall of skilled local talents in high value-added industries has hindered the long-term development of Hong Kong. Young people are our future. They possess immense potential to propel Hong Kong’s economy forward and are the lifeblood of different sectors. The Human Resources Planning Commission is working at full steam to develop forward-looking strategies to nurture high-quality home-grown talents that will excel and move forward and upward. Education is the key to developing a talent pool to facilitate Hong Kong’s development into a diverse, knowledge-based and technologically advanced economy. We believe that the Government’s expenditure on education is the most meaningful and worthy investment in our future. Since assumption of office in July 2017, the current-term Government has injected a total of $8.3 billion additional recurrent resources into the education sector, of which a substantial portion was allocated to improve basic education including science, technology, engineering and mathematics (STEM) education in primary and secondary schools. We have also introduced a series of policy measures to improve access by our young people to higher education through multiple pathways including University Grants Committee (UGC)-funded universities and self-financing institutions, with a view to broadening our next generations’ visions and horizons and equipping them with professional skills that will help maintain their competitive edge and realise their potential in this new economic era. Since the implementation of the four-year undergraduate curriculum, our universities have devoted much effort in reorganising the curriculum to achieve our policy goal. The introduction of newly designed general education programmes, which now cover around 30% of the entire curriculum, allows students to broaden their knowledge extensively across different subject areas and strengthen their creativity, leadership and communication skills. Such a whole-person education regime is fundamental to nurturing the all-round talents that are most sought after by industries. In addition, the UGC triennial funding exercise provides broad planning parameters, including specific manpower requirements and non-binding general manpower remarks to encourage universities to keep abreast of the latest manpower trends and social needs when considering allocation of course programmes. I am delighted to note that universities have responded positively to the Government’s call for promoting I&T and offered more cross-disciplinary programmes in the planning cycle, including programmes on artificial intelligence and fintech. To provide multiple and flexible pathways for local students to pursue post-secondary education, the HKSAR Government has stepped up support for self-financing sub-degree programmes that nurture talents to meet our social and economic development needs. It is anticipated that about 4,000 students will benefit in each academic year. This initiative will incur $120 million additional recurrent expenditure each year. Vocational and professional education and training (VPET) allows young people an alternative pathway to traditional academic education. VPET has an important role in unleashing the potential of young people and enhancing the employability of working adults, and at the same time, attracting and retaining talents that suit the needs of relevant industries. The Vocational Training Council (VTC) offers 1,200 training places per year to enable trainees to join industries that require specialised skills under the Earn & Learn model. Furthermore, to encourage working adults in designated industries to pursue higher qualifications, the Government provides subsidies to cover tuition fees for students admitted to designated professionals part-time programmes offered by the VTC. The HKSAR Government also sees the need to attract and nurture more technology talent from other places to build a critical talent pool for driving I&T development in Hong Kong. Noting the specific manpower need for emerging industries, particularly the I&T sector, we launched the Technology Talent Admission Scheme in May last year to fast-track the admission of overseas and Mainland research and development talents to meet the talent demand by the sector. We further rolled out the Technology Talent Scheme last August to subsidise research institutions and enterprises to recruit talents to carry out R&D activities and train their existing staff to apply advanced technology to add value to their businesses. To nurture our local talents to be involved in R&D, we will also provide tuition fee waiver for all local students enrolled in UGC-funded research postgraduate programmes from this academic year onward. As for our existing workforce, we encourage them to pursue continuing education to help them keep abreast of the latest technological advancement, professional standards and career path, thereby strengthening their adaptability and resilience to the ever-changing economy. To this end, the HKSAR Government has injected $10 billion into the Continuing Education Fund to support the implementation of various enhancement measures to promote lifelong learning, enrich job skills for the rapidly changing environment. Our local enterprises also join us in grooming our next generations into professionals. The Hong Kong International Aviation Academy established by the Airport Authority nurtures local and regional air transport management talent to support the long-term development of the airport and the sustainable growth of the aviation industry. The MTR Academy established by the MTR Corporation Limited trains railway professionals. These two academies offer tailor-made courses for the aviation and railway industries. Many of the courses target secondary school graduates and are recognised under the Qualifications Framework. On completion of the courses, students can pursue careers in the transport and railway industries in Hong Kong and abroad. ​In addition, the Towngas Engineering Academy of the Hong Kong & China Gas Company Limited, and the CLP Power Academy of the CLP Power Hong Kong Limited, offer recognised professional courses for young people who are interested in gas, electrical and engineering work. To train more high-calibre construction practitioners and raise the professional image of the construction industry, the Hong Kong Institute of Construction was set up last year to offer a wide range of construction courses, including diploma courses accredited at Qualifications Framework Level 3 to provide students the opportunity to receive professional training, and at the same time obtain recognised qualifications in a progressive manner. The Government also strives to enrich students’ learning experiences by broadening their horizons through internships, work attachments and exchange opportunities in Hong Kong, on the Mainland and other places overseas. We are taking the lead to organise, fund and co-ordinate with education institutions and the business community to enable an average of 70,000 young people to participate in internships and exchange programmes each year. ​To strengthen our efforts, we are forging partnerships with 16 locally based major corporations to launch the Scheme on Corporate Summer Internship on the Mainland & Overseas. The scheme aims at providing quality internship opportunities for university students to explore opportunities outside Hong Kong. Over 230 young students have benefited from these experiential learning opportunities. This is the first time for the Government to take such an active role as a facilitator and promoter to collaborate with the business sector in providing these internship placements. In view of the positive responses gained in the pilot scheme, we will expand the scheme this year to provide more internship opportunities on the Mainland, countries along Belt & Road corridors and beyond. Taking advantage of this gathering of business leaders today, I would like to appeal to you all to join the scheme and offer more work placements to our young people. To assist young people in participating actively in innovation and entrepreneurship, the HKSAR Government has stepped up support to provide young entrepreneurs with financial subsidy through the Entrepreneurship Matching Fund. We have also made considerable efforts in promoting tripartite partnership among the private sector, non-governmental organisations and the Government to provide work space at concessionary rental at almost two-thirds of market rent through the Space Sharing Scheme for Youth, to provide guidance and strengthen support for our young people. Having gone to great lengths on how Hong Kong nurtures talents and creates synergies between the education sector and employers, I would like to end my speech by addressing the younger audience here. You are the future of Hong Kong. Your unique talents and aspirations fuel the vibrant and diverse development of this Asia’s world city. The Government strives to open as many doors as possible to you all to realise your dreams and seize opportunities for upward mobility. We treasure your views and are eager to bring your voices into the Government. To encourage participation of young people in policy discussion and debate, we introduced a pilot scheme in 2017 to recruit self-recommended young members to five advisory committees and received overwhelming responses from our young people. Given this roaring start, we have regularised the scheme and Phase I of the Member Self-recommendation Scheme for Youth was introduced in June last year, and successfully recruited more than 30 young members appointed for 15 committees. The second phase of the Member Self-recommendation Scheme for Youth has just been launched, and I strongly encourage you to join the scheme to contribute to the betterment of the community and bring your voices into the Government. Hong Kong plays a pivotal role in our country’s strategic initiatives including the Belt & Road Initiative and the Guangdong-Hong Kong-Macao Bay Area development. We have signed the ASEAN Trade Pact that will provide boundless opportunities for Hong Kong’s talent. But Government’s efforts alone are not enough. We need all sectors of society to join hands to help nurture a pool of talents for developing Hong Kong into a high value-added and diversified economy. The year 2019 has just begun. In face of the cloudy international trade environment, coupled with the rise of unilateralism and trade frictions between the two largest economies worldwide, Hong Kong people’s flexibility, perseverance and courage to face the challenges will help us surmount all difficulties, seize the opportunities and move towards a brighter future. 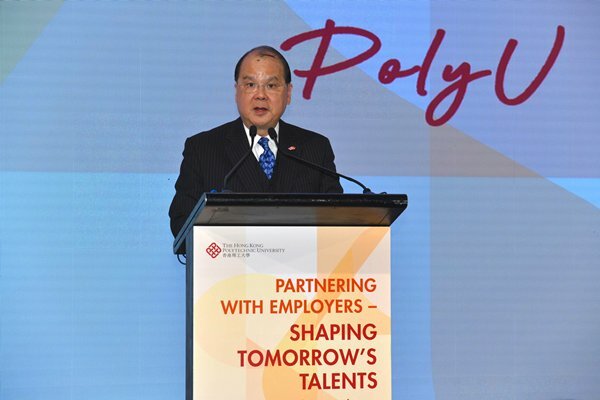 Chief Secretary Matthew Cheung gave these remarks at the Hong Kong Polytechnic University Partnering with Employers – Shaping Tomorrow’s Talents luncheon on January 18. I must say I’m delighted with the British Council’s pitch-perfect choice of venue. Tai Kwun, the former Central Police Station Compound, is now a centre for heritage and arts, a dynamic new Hong Kong cultural landmark. And Tai Kwun is not only the venue for SPARK but also the subject of a featured event. The UK’s Purcell, one of three architectural firms behind Tai Kwun’s revitalisation, will lead walking tours here, detailing how old and new have come together – and so remarkably well – at Tai Kwun. I am truly impressed. Of course, it’s not the first time Hong Kong has been dazzled by British ingenuity. Just last March, Hong Kong’s Asia Society hosted the GREAT Festival of Innovation, smartly presented by the UK Department for International Trade. These and many other such events speak of the longstanding and long-rewarding relations that exist between the economies and the people of Hong Kong and the UK. Such relations are set to get even closer in the future. I visited London in September 2017 as the Chief Executive to attend the Hong Kong Dinner, which is an annual tradition celebrating the ties that bind us in government and business, in culture, history, education and many other aspects. During my trip, I met with many senior government officials, members of parliament, businessmen, education professionals, etc, and set in motion many collaboration initiatives between Hong Kong and the UK. Last March, Dr Liam Fox, Secretary of State for International Trade, visited Hong Kong. Aside from opening the GREAT Festival of Innovation, Dr Fox signed a joint statement on closer collaboration in trade and economic matters with our Secretary for Commerce & Economic Development Edward Yau. Then, last September, Chief Secretary for Administration Matthew Cheung signed an MOU on Cultural Co-operation between Hong Kong and the UK while visiting London. Last month, I officiated at the opening ceremony of an exhibition at the Hong Kong Science Museum. Treasures of Time is jointly organised by the Hong Kong Science Museum, the Science Museum, London, and Beijing’s Palace Museum. The timely exhibition displays about 120 rare mechanical clocks and watches from the Palace Museum collection; most were tributes from Europe presented by Western missionaries to the Qing court. Among the exhibition highlights is a workshop depicting 18th century Europe. That workshop, I’m pleased to note, was brilliantly recreated with tools and equipment provided by the Science Museum, London. This fabulous exhibition illustrates that Hong Kong offers the best platform for cultural exchanges between East and West. For SPARK, we have the British Council in Hong Kong to thank. The British Council has been instrumental in presenting the best of British culture and education in Hong Kong since 1948, more than 70 years ago. And I still vividly remember Antony Gormley’s Event Horizon, showcased here by the British Council and brought to us a few years ago, which truly amazed many with Sir Antony Gormley’s life-size sculptures. SPARK today is no exception. The Festival’s four themes – Creative Cities, Art meets Science, Altered Realities and Future Skills – have been designed for people of all ages. But they will no doubt resonate in particular with our youth, offering insight and inspiration that could well lead to creative career choices – in culture and the arts, the sciences and education. I have said on many occasions that Hong Kong’s future is predicated on our young people, their talent, their vision and their innovative spirit. So I am grateful to the British Council for bringing SPARK: The Science & Art of Creativity, to Hong Kong. 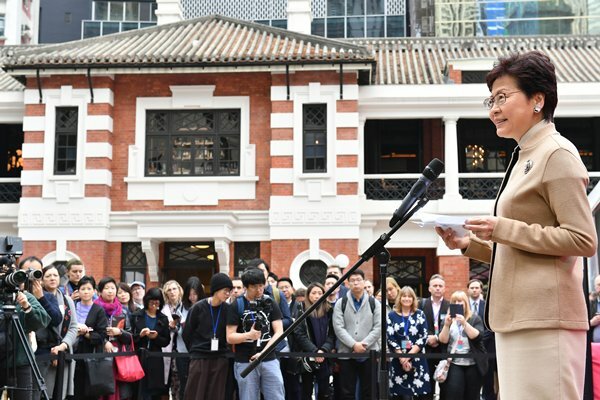 Chief Executive Carrie Lam gave these remarks at the opening ceremony of SPARK: The Science & Art of Creativity on January 18. Indeed, since becoming Chief Executive of the Hong Kong Special Administrative Region in July 2017, I have placed innovation and technology development at the top of my policy agenda. To that end, I’ve launched an eight-pronged strategy to promote innovation and technology in Hong Kong. To date, my Government has committed US$10 billion towards a variety of innovation and technology initiatives, ranging from boosting research funding for universities to building a huge new science park in co-operation with the Shenzhen Government. Hong Kong enjoys full support from the Central People’s Government under the “one country, two systems” principle. For more than two decades, since the return of Hong Kong to our motherland, the “one country, two systems” principle has given us benefits available to no other economy. As the multilateral business bridge between the Mainland and the rest of the world, Hong Kong has flourished in business and finance. And I have no doubt that singular advantage will help power our success in innovation and technology as well. World-class talent, of course, is essential to realising that vision. It’s why, last June, we launched the Technology Talent Admission Scheme. It enables our technology companies and institutes to admit on a fast track basis overseas and Mainland technology talent in such technology areas as biotech, AI (artificial intelligence), cybersecurity, robotics and data analytics. In addition, last August, we established another scheme, the Technology Talent Scheme. The Postdoctoral Hub programme funds companies looking to recruit postdoctoral talent for scientific research and product development. The scheme also funds local companies on a two-to-one matching basis, training their staff in high-end technologies, especially those related to Industry 4.0, through the Re-industrialisation & Technology Training Programme. My Government is equally committed to STEM education. We are determined that our future generations adapt and thrive in a technology-driven world. STEM education’s success cannot be achieved in schools alone. Close co-operation between government, academia and technology companies is essential. And that collaboration must be both global and local, if we are to compete with the world in the 21st century of boundless opportunity. Which is why I am delighted that the five distinguished laureates with us this evening will share their wisdom with young Hong Kong scientists and students at a university forum tomorrow. I’m hopeful, as well, that tonight will be the beginning of a long and mutually rewarding relationship between Hong Kong and the Heidelberg Laureate Forum. To that end, my Government, our universities and research institutes have been pleased to promote the 2019 Heidelberg Laureate Forum, which takes place this September, to our young mathematicians and computing scientists, encouraging their interest and participation. 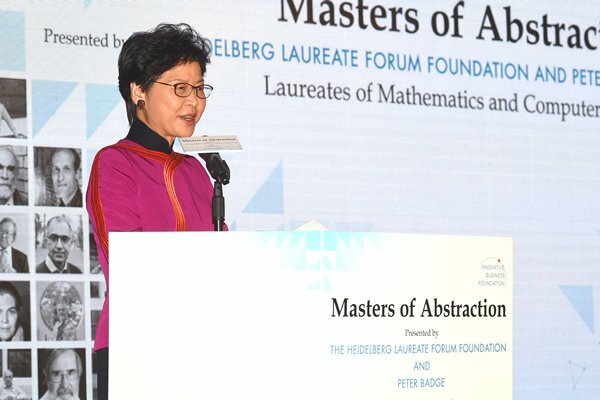 Chief Executive Carrie Lam gave these remarks at the Masters of Abstraction Gala Dinner on January 17. Since taking office in July 2017, I have been advocating new roles of the Government in order to scale new heights and we have adopted a new tagline for branding our city, and that is, to connect and excel. Indeed, you can say that we are reshaping our city for the economic promise that this 21st century will surely bring the countries and economies of Asia, Hong Kong very much included. Of course, we remain the world’s bridge between East and West, as between Mainland China and the rest of Asia. Our role of connecting companies, economies and cultures continues to grow, and we continue to find fresh ways of helping businesses and people to excel, whatever it is they are building or pursuing, whatever their ambitions or their vision. Thanks to our deepening economic integration with the Mainland, we are also taking full advantage of two national strategies of Mainland China to build on our world-class strengths in financial and professional services, and to develop, as well, our fast-emerging innovation and technology sector. I am talking about the Belt & Road Initiative and the Guangdong-Hong Kong-Macao Greater Bay Area. I will be happy to tell you more about these opportunities in a few minutes. But let me first give you a brief update on Hong Kong. Our economy, I am pleased to say, expanded by 2.9% in real terms in the third quarter of 2018, marking Hong Kong’s eighth consecutive quarter of above-trend growth. Through the first three quarters of 2018, our economy grew by 3.7%, year-on-year. Due to some external factors, economic growth for 2018 as a whole is forecast at a moderated rate of 3.2%. And our unemployment rate remains at 2.8%, which is a 20-year low. I would say that these figures are more than respectable, given the ongoing uncertainties of the global economy. Thanks to our open and externally oriented economy, we have been a global leader in trade. In 2017, our exports and imports of goods and services amounted to better than 370% of our GDP. That year, Hong Kong was ranked the world’s seventh-leading trading economy, our trade totalling US$1.14 trillion – up 7.15% over the previous year. We continue to be closely linked with the economies of Asia. Indeed, nine of Hong Kong’s top 10 trading partners are from Asia, and they accounted for US$912 billion, almost 80% of our total merchandise trade in 2017. Those numbers, and our focus on Asia, will surely expand down the road. Asia, after all, accounts for more than 60% of global growth, according to the International Monetary Fund (IMF). Last year’s full-year results are not yet in, but growth in Asia in 2018 is expected to reach a laudable 5.6%. This year, the IMF projects Asian growth at about 5.4% – still considerably higher than the projected global average of 3.7%. In short, the fast-growing Asian market presents huge potential and myriad business opportunities for all of us. The Hong Kong Government maintains 12 overseas Economic and Trade Offices (ETO), including Tokyo, Singapore and Jakarta in Asia. That is not nearly enough, not if we are to take advantage of the expanding business opportunities in Asia. Which is why we have announced that we are planning to add five new ETOs, three of them in Asian cities: Bangkok, Mumbai and Seoul. Among them, I am pleased to say that the Bangkok ETO, which is the most recently announced one, is going to open soon, hopefully in February this year. We also hope to set up the Mumbai ETO soon. For this, I look to the Consul-General for his support. Hong Kong and India have strong, long-established ties, both economically and culturally. Hong Kong is home to a large Indian community and many Indian companies. And we greatly value and treasure the manifold contributions that the Indian community has made to Hong Kong over the decades. In 2017, our bilateral trade reached US$34 billion, up 27% over 2016 results. I am confident that, with the new Mumbai ETO in India up and running, our bilateral ties will reach new heights in our business, trade and cultural co-operation. Hong Kong’s working philosophy, whether in enhancing ties with India, the Mainland, the rest of Asia or the world beyond, focuses on the mutual rewards that open, inclusive and sustainable growth can realise. That considered approach is supported by our unique advantages under the “one country, two systems” principle. Thanks to “one country, two systems”, Hong Kong maintains an open and free market, a simple and low tax regime and a level-playing field for companies. For the past 24 years in a row, the Heritage Foundation has named Hong Kong the world’s freest economy. Last year, we finished second worldwide in the Swiss-based International Institute for Management Development’s World Competitiveness Yearbook. And in this year’s World Bank “Doing Business” report, we placed number four. Our attractiveness to overseas business is visible in the increasing number of offices set up by international companies in Hong Kong. At last count, more than 8,700 businesses with parent companies overseas or in Mainland China maintained an office here. That, ladies and gentlemen, is up 6.4%, year on year. Let me add that nearly 50% of them have parent companies based in Asia. Further, among the 8,700 businesses, 1,530 are regional headquarters, increased by 8.3%, year-on-year. Hong Kong has long been the business bridge for foreign investors seeking access to the Mainland market. Our gateway position was appreciably strengthened by CEPA, the Mainland and Hong Kong Closer Economic Partnership Arrangement. As a free trade agreement, CEPA was first established in 2003 and enhanced in the years since then. CEPA provides preferential treatment to Hong Kong service suppliers, as well as tariff-free treatment for products of Hong Kong origin. The beauty of CEPA is that it is nationality-neutral. That means overseas companies need only partner with Hong Kong or set up an office here to realise CEPA’s wide-ranging business advantages. We are, as well, expanding our network of free trade agreements, investment agreements and comprehensive avoidance of double taxation agreements with foreign economies. Since I took office as Chief Executive in July 2017, my Government has established free trade agreements with the Association of Southeast Asian Nations (ASEAN) and with Georgia. We have, as well, recently concluded negotiations with Australia and the Maldives. I am determined to realise more free trade agreements in the years to come, in order to enhance prospects and opportunities for Hong Kong companies and service providers, as well as our business partners. President Xi’s embrace of multilateral co-operation and the shared benefits it can bring is powerfully reflected in the Belt & Road Initiative and the international connectivity it enables. Our strategic location and status as an international trading and financial services centre make Hong Kong the ideal springboard for overseas companies looking to tap the resources, the markets and the opportunities that the Belt & Road affords. Hong Kong enjoys distinct economic, legal and social systems. They are backed by a deep pool of professionals. Their expertise ranges from infrastructure development and engineering to consultancy, accounting, law and more, and their global networks and affiliations are extensive. No less important, they are well versed in cross-border business transactions. They can make all the difference for countries and companies taking part in the Belt & Road Initiative. Our strength in financial services is powered by capital formation. Thanks to our liquid capital flow, Hong Kong is the natural centre for those looking to raise capital for infrastructure, as well as production and investment projects. In particular, Hong Kong is well positioned to respond to green financing needs. In the coming months, we will launch a government green bond issuance programme. It will come with a borrowing ceiling of about US$13 billion, making it one of the world’s largest sovereign green bond issuances. We have also initiated a Green Bond Grant Scheme that subsidises the costs issuers incur in obtaining certification under our Green Finance Certification Scheme. In short, Hong Kong has what it takes to become a fund-raising hub for green projects, and I am confident our bond market will attract Belt & Road investors. Alongside our financial acumen, Hong Kong is a hub for risk management, insurance and dispute-resolution services. Our legal services sector is renowned. Its foundation is the rule of law, underpinned by an independent judiciary and robust intellectual property rights protection. Arbitral awards made here are enforceable in more than 150 jurisdictions, including the Mainland. Hong Kong boasts more than 13,000 lawyers, and many more legal professionals. They come from all over the world, and their services range from risk assessment and the drafting of contracts, to dispute resolution for investment and commercial deals. The connectivity that drives the Belt & Road extends well beyond infrastructure or the business and trade it enables. Building people-to-people bonds is also one of the key objectives. Such bonds must, of course, be inclusive, if they are to be meaningful. That, unfortunately, is not always the case. Despite the remarkable socio-economic transformation of Asia in recent decades, the gains have not always benefited those in need. The result is communities, regions and economies experiencing more, not less, inequality; more, not less, environmental degradation. If economic development is to become more inclusive, we must find ways of expanding essential needs, ensuring that our societies have access to such basics as safety, equity and justice. In that regard, ladies and gentlemen, Hong Kong has much to offer. And we are happy to share our experience and to help emerging economies build their capacity. I see it as part of our contribution to expanding people-to-people bonds, whether in the Asian region or in the broader reaches of the Belt & Road. It begins with our city management expertise. That ranges from town planning and railway operation, to flood prevention, slope stabilisation, aviation safety and emergency services. We have, as well, the institutions and the experience to promote equal opportunity, deal with administrative complaints and fight corruption. Indeed, some of our institutions, from the Independent Commission Against Corruption to the Fire & Ambulance Services Academy, offer training and experience-sharing with their counterparts in Asia, including Belt & Road economies. The Independent Commission Against Corruption, for example, has in place a dedicated unit providing training services for anti-corruption agencies in Belt & Road countries. Similarly, our Fire & Ambulance Services Academy has helped train firemen, for example, from Vietnam, and the Academy welcomes opportunities to work with other Asian and Belt & Road economies. It’s much the same with the Hong Kong Airport Authority and its aviation academy, as well as our Mass Transit Railway Corporation, which has established a rail academy. Their doors, ladies and gentlemen, are always open. Such capacity building helps promote inclusive growth. That in turn can only strengthen confidence in the Belt & Road Initiative and the welcome co-operation it offers us all. Ladies and gentlemen, you can learn more about the prospects and the promise of the Belt & Road Initiative in September, when Hong Kong hosts its fourth Belt & Road Summit. The summit is now the largest, most important annual gathering among Belt & Road project owners, investors and service providers. The third summit held in June last year attracted about 5,000 government and business leaders from some 50 countries and regions. Allow me now to briefly touch on the other important national strategy of Mainland China, which is the fast-rising Guangdong-Hong Kong-Macao Greater Bay Area, the development plan of which will soon be promulgated. The Greater Bay Area covers Hong Kong, Macau and nine prosperous Guangdong cities, bringing together a collective population of about 70 million, and a GDP of more than US$1.5 trillion. While the Greater Bay Area accounts for only 5% of the Mainland’s population, it is responsible for fully 12% of the Mainland’s GDP. That’s equivalent to the GDP of Australia or Korea. Air passenger and cargo throughputs of the Greater Bay Area rank first among the world’s major bay areas. While the New York, San Francisco and Tokyo bay areas may pride themselves on their status as financial, technology and industry hubs respectively, the Greater Bay Area encompasses all of that. The Greater Bay Area is built on complementarity instead of competition among the cities. Hong Kong, China’s most international city, will play the role as an international finance and trade hub, as well as a global arbitration centre. In addition, we look to contribute to the Greater Bay Area’s development into an international innovation and technology hub. Hong Kong has much to offer, including world-class universities and scientific research capabilities. We have, as well, a government, and a Chief Executive, that places Innovation & Technology at the heart of our policy agenda in this 21st century of endless change and boundless promises. Combined with the strengths of Mainland cities such as their advanced manufacturing capability, the Greater Bay Area has all it takes to become Asia’s Silicon Valley. We welcome talent, technology enterprises and scientific institutions from Asia and from all over the world to join us. 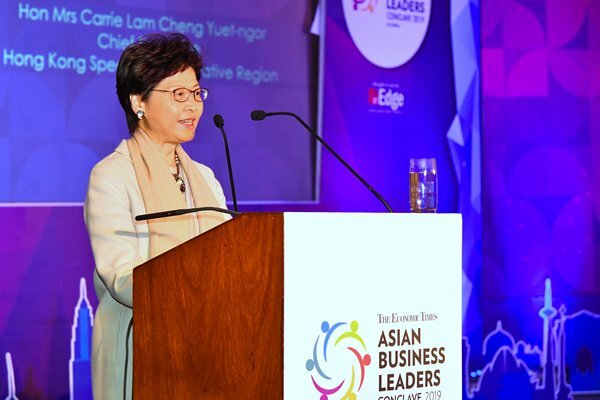 Chief Executive Carrie Lam gave these remarks at the Economic Times Asian Business Leaders Conclave 2019 on January 17. I’m pleased to be here today for the launch of the latest version of the Financial Literacy Strategy, with a continuing and vitally important mission to advance the financial literacy of the people of Hong Kong. That mission was set in motion with the establishment of the Investor Education Centre – now the Investor & Financial Education Council – in late 2012. It took flight three years later, with the release of the Hong Kong Financial Literacy Strategy in 2015. The new strategy unveiled today builds on the inaugural version, applying what has been learned in the past three years about financial literacy and focusing on those who need it the most. This is why this 2019 version puts more emphasis on financial literacy and socio-economic issues, from our ageing population and youth development to financial inclusion. It’s also why this new version emphasises specific target audiences, including youths, working adults, the elderly, low-income families and those who struggle with low income and less community integration. Today’s financial market is endlessly changing and complex, with technology increasingly driving financial innovation. At the same time, such societal changes as increased longevity have brought about new considerations and needs in financial planning, at both the individual and the community levels. In short, people today must be equipped with the relevant knowledge to make informed financial choices under rapidly changing socio-economic circumstances. That is certainly no easy task. Hong Kong, of course, is one of the world’s leading international financial centres. We take pride in offering a wide range of financial services and products. The people of Hong Kong have long participated in the financial market through, for example, the trading of stocks. There are clearly some concerns regarding Hong Kong’s overall financial knowledge according to recent surveys. For example, while about 80% of the people of Hong Kong have financial goals, less than half have taken the necessary actions to achieve those goals. Although four out of five people lived within their means, some 40% of respondents lacked the emergency funds to respond to unexpected financial needs. For those who borrow money, about 20% admitted to failing to make their debt repayments on time. In short, there is room to improve financial literacy and awareness in Hong Kong. That makes the new strategy all the more timely. To be sure, financial education – like education in general – is a long-term process, if not a life-long pursuit. In its six years of existence, however, the Investor & Financial Education Council has laid a solid foundation in enhancing the financial literacy of our people, including the elderly, working adults, youths and school children. The Chin Family, and its lively cartoon characters, is now a household name. And in March, the third edition of Money Month will be held, bringing together the financial planning prowess of Government, finance, education, the media and more. I’m pleased to note the council is hardly alone on the financial education front. The Hong Kong Monetary Authority, for example, has launched a Consumer Education Programme. It offers tips on banking and related products and services that includes the recently launched Faster Payment System, as well as stored-value facilities, Internet banking services, ATMs and credit cards. And HKMC Annuity, a subsidiary of the Hong Kong Mortgage Corporation, runs a campaign to boost public awareness of the suitability, and of course, the associated risks, of using your life annuity as a retirement-planning solution. The Securities & Futures Commission issued guidelines relating to the distribution and trading of virtual assets in last November. The commission, of course, oversees the new Investor & Financial Education Council. 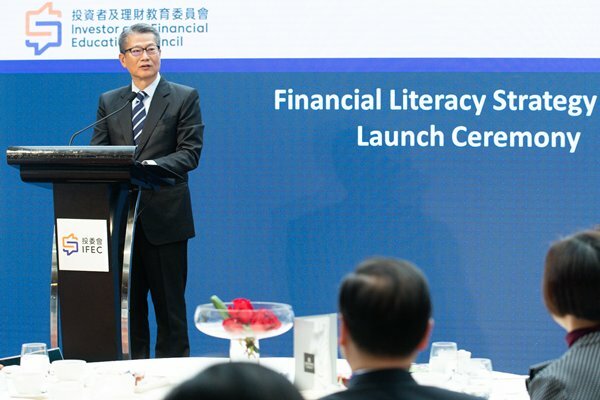 Financial Secretary Paul Chan gave these remarks at the Financial Literacy Strategy 2019 Launch Ceremony on January 17. This milestone occasion brings together four of the world’s leading universities – and from three continents – for pioneering medical research here in Hong Kong. It is indeed the fourth occasion of an MoU signing ceremony for such collaborative research that I had witnessed in the past seven months. The other three MoU signing occasions involved equally distinguished and renowned institutions from France, Germany and the United States. One could not help thinking that this is clear and compelling testimony of Hong Kong’s singular ability to create connections, to help people, businesses and institutions excel, whatever they’re pursuing, whatever their vision. That said, I must thank those overseas renowned universities and research institutions for placing their trust in us, and our local Consulates for helping us to connect. The presence today of the United Kingdom Consul General and the Acting Consul General of the United States is much appreciated. Developing Hong Kong into an innovation and technology (I&T) hub is central to my Government’s economic policy. In my maiden Policy Address delivered in October 2017, which is just three months after I have assumed the office of the Chief Executive, I set out eight major areas for our innovation and technology progress, including expanding our infrastructure, pooling technology talent and boosting research and development (R&D) funding. Since then, my Government has allocated about US$10 billion for I&T initiatives, including significant resources for R&D activities. Among other things, we are bolstering R&D in our universities and public research institutes. We have also instituted a super tax deduction of up to 300% to private enterprises for their R&D expenditure. No less important, we have set aside US$1.3 billion to establish two research clusters – one for healthcare, the other for artificial intelligence and robotics. The good news is the newly created partnership we are witnessing today will apply for participation in the healthcare research cluster – known as health@InnoHK. Specifically, the Hong Kong University of Science & Technology, Boston Children’s Hospital, a Harvard Medical School Teaching Hospital, Stanford University School of Medicine and University College London will conduct research on neurodegenerative diseases, working out of Hong Kong Science Park. As we all know, neurodegenerative diseases, particularly Alzheimer’s, are becoming more prevalent in ageing populations. And while understanding of neurodegenerative diseases continues to advance, there are few effective treatments available, either to delay the onset or to affect the course of Alzheimer’s and other daunting neurodegenerative diseases. I am, however, hopeful that the combined excellence and collective commitment and expertise of four of the world’s leading institutions, and their scientists and researchers, can lead to significant advances in the diagnosis and treatment of neurodegenerative diseases. 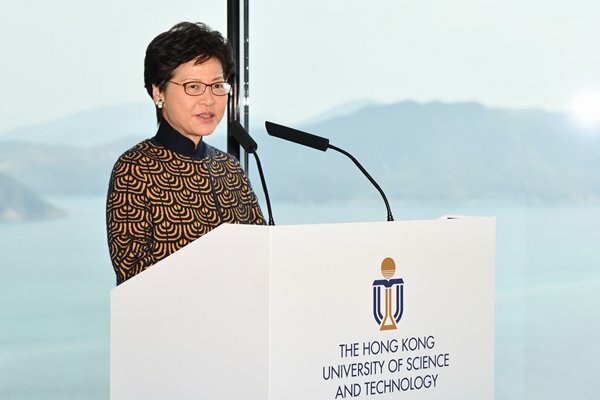 I am also confident that this research consortium will create wide-ranging, world-class opportunities for the next generation of Hong Kong scientists and researchers, and in doing so, establish Hong Kong as an international centre for research in neurodegenerative diseases. Chief Executive Carrie Lam gave these remarks at the Memorandum of Understanding for Establishing The Center for Neurodegenerative Diseases signing ceremony on January 16. To begin, the open-ended fund company regime came into operation last July. It marks the first time that Hong Kong has established a dedicated legal framework for fund vehicles. No less important, it showcases the Government’s commitment to making Hong Kong a multidimensional fund centre. And I am confident it will create more opportunities for our fund and related businesses. Last month, the bill extending profits tax exemption to onshore funds, in addition to offshore funds, was introduced in the Legislative Council. Under this bill, private equity funds are among those that will enjoy profits tax exemption. A tax-exempt fund can invest in local and overseas private companies. I am hopeful that the new tax treatment will take effect very soon. Last April, we rolled out a new listing regime for pre-revenue, or pre-profit, biotech companies and companies with a weighted voting rights structure. To date, seven have been listed on the Stock Exchange of Hong Kong under the new regime, and many are in the pipeline. Good news too on the IPOs (Initial Public Offerings) front. Last year, Hong Kong raised about $287 billion through IPOs, claiming the global IPO crown. Indeed, Hong Kong has ranked first globally six times in the past 10 years. We continue to add jurisdictions with which we have mutual recognition arrangements with regard to funds. Yesterday, Luxemburg joined our existing partners of the Mainland, Switzerland, France and the United Kingdom. And then there’s Hong Kong’s role as one of the world’s leading international financial centres. You can see that, at work brilliantly, during this International Financial Week here, which began with the impressive two-day Asian Financial Forum concluded only yesterday. Today’s forum is another highlight, as is tomorrow’s EMPEA Private Equity Masterclass, organised by the Hong Kong Venture Capital & Private Equity Association. Numbers also underline Hong Kong’s status as a financial services powerhouse. We rank third in the Global Financial Centres Index, behind only London and New York. We topped the Milken Institute’s Global Opportunity Index in 2017. And for the past 24 years in a row, the Washington-based Heritage Foundation has named Hong Kong the world’s freest economy. Add it up, and you have a financial foundation as formidable and deeply rooted as anywhere in the world. And I have no doubt that economic growth and accelerating wealth creation in this part of the world, particularly the Mainland of China, will continue to support Hong Kong’s asset and wealth management business. At the end of 2017, assets under management in Hong Kong totalled some US$3.1 trillion. Non-Hong Kong investors accounted for two-thirds of this. Private equity is critical to our asset and wealth management landscape. We are Asia’s second-largest private equity centre, trailing only the Mainland. As of mid-2018, our private equity players managed US$152 billion in Hong Kong. That is about 16% of the total capital under management in Asia. During the first half of 2018, private equity funds raised in Hong Kong amounted to US$12 billion, about 20% of the total funds raised in Asia. Given investors interest in diversified portfolios – both in asset class and geographical exposure – Hong Kong can only continue to capture business opportunities in the Asian private equity market. In the coming months, we will put out a proposal for industry consultation about introducing a limited partnership regime for private equity funds in Hong Kong. Thereafter, we will introduce a bill in the Legislative Council. If passed, it would be the second dedicated regime for a fund vehicle in our law books. The Financial Services & the Treasury Bureau is working closely with the Hong Kong Monetary Authority and the Securities & Futures Commission on this proposal. Our objective is to have a regime catering for the needs of private equity funds, while safeguarding investor protection. The Government will continue to boost Hong Kong’s unique role as gateway between international markets and investors and their counterparts on the Mainland of China. We’ll do so through the Stock Connects, Bond Connect, and the Mutual Recognition of Funds arrangements. We will also further strengthen our position as the global offshore RMB business hub. At the regional level, we will continue to take part in the Guangdong-Hong Kong-Macao Greater Bay Area development. Its sheer market size and number of high net-worth individuals, coupled with the policy objective of enabling people, goods, capital and information to flow freely within the region, will expand opportunities for our asset and wealth management sector. Turning to the Belt & Road Initiative, Hong Kong’s financial services industry is well positioned to contribute in a number of areas. Given our liquid capital flow and deep pool of financial talent, Hong Kong is the natural centre from which to raise funds for infrastructure, investment and production projects. We are also ideally suited to provide the risk management, insurance and dispute-resolution services that big-ticket infrastructure projects need. Green finance is also promising. And I am pleased to report that the Government will soon launch its green issuance under the Government Green Bond Programme, which has a borrowing ceiling of $100 billion. 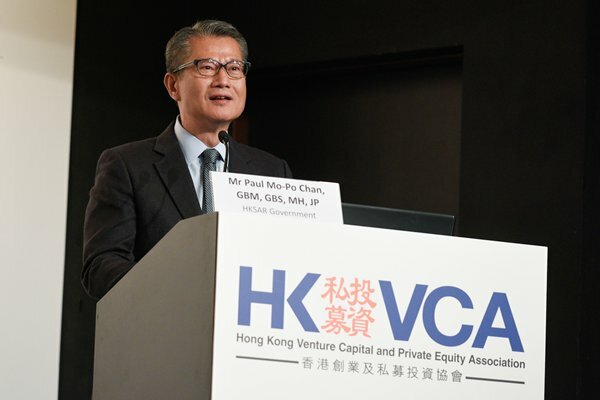 Financial Secretary Paul Chan gave these remarks at the Asia Private Equity Forum 2019 on January 16.